This entry was posted in adoption, foster care and tagged a child's name is part of their identity, changing the adopted child's name. Bookmark the permalink. I adopted 3 siblings in Feb of 2018. We were a “kinship” placement even though we have no relation to the Biological family. We have known the birth mom and her family for over 20 years. We approached the idea of the name change with trepidation. The children pressed very hard for name changes so we discussed this in great detail with therapists, the children, family, and caseworkers. One of the children kept her middle name. the other 2 did complete name changes. The names we agreed on with the children are versions of their prior names either changed slightly or shortened. They are very proud of their new names and do not like being called by their previous names. We changed names and social security numbers due to my background in fraud and Identity theft prevention. My husband was against the change but accepted it due to the children’s desire. The biological family became angry and aggressive after the change and refuses to accept it. I have had to block them on facebook due to comments, notify police when the biological mother sent hate mail from prison, and return birthday cards to bio grandma due to her refusal to acknowledge the change. She will send a letter with the previous first name only and underline it with no last name. it upsets the children that they are not respectful of their choices which has caused us to have very limited contact with a family that was part of my family once as well. We do not regret this decision since the children requested the change and we honored the request after a lot of research and discussion. The one thing you should know as that no matter what the outcome by others perceptions, thought, and feeling they do not walk in your families shoes and your reality is what matters. The joy this has brought our children was only overshadowed by the pain inflicted by a biological family who was selfish about their own thoughts. Do what is best for you and your family and you will never be wrong. I would love to hear from folks adopting kin. We are adopting two sibling groups (three plus two), and they are all nieces and nephews of mine. The oldest is 15, and the youngest is 17 months. We are struggling to come to terms with any changes because of the family ties. They all have last names different from ours, and they still have very limited contact with their biological mothers. We are talking through the name changes, and taking their thoughts into consideration. But I’m concerned that they may regret any changes. My adoptive parents changed my name from Marie to diedre. I was 5. I am now 60 and realizing that Marie is still inside. I feel it was a mistake on many levels. Thanks for voicing this angle. We are not pets from the shelter that you can just adjust to feel right for the new fit. We believe we will be adopting our two little ones in Jan or February. We have had them 15 months, and they are now 3 and 4. I want to change their names. This is because their names are so crazy and truly not even names. I don’t want them to have to live life with this names that is hard to pronounce and is so different like nutzz. We haven’t told them their new names, and I have talked in great deal with other adoptive parents. I will build it up as a gift parents give their babies, we are reading stories in our Bible where God changed people’s names, and we will be changing their whole names. I live in the same large city as the bio. mom, and I feel it will just make me feel more at ease that she won’t be able to find them so easily. I am speaking on behalf of parents, like myself who have had their babies ripped from them by cps. Some children are better off being removed from their biological parents, but for parents like myself, who had their babies taken in a situation where it was completley unnecissary…well this conversation strikes horror and grief into my heart. If i need to explaine my situation i will, but for now lets stick to the conversation at hand. 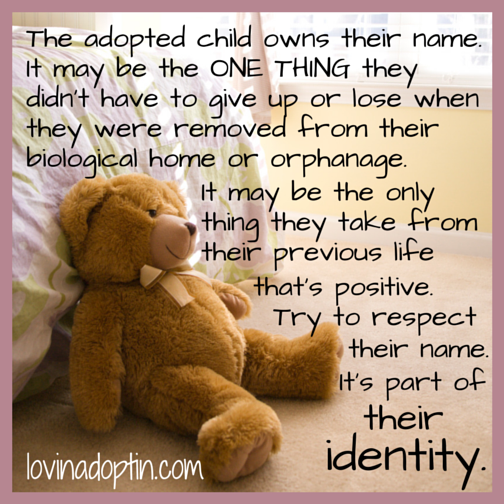 For me the thought of a foster or adoptive changing my childs whole identity is devestating. I have worked so hard every day of my life building something to leave my children when im gone. Even though there are not with me the only thing that keeps me hangging on are the hopes that one day my children will find me….or the things ive built for them to have when i pass away. And that maybe they will know their mom always loved them and never gave up on them. Hopefully i am still alive and they want to find me and i can reconnect with them. Its been 4 years and it hurts me so much everyday knowing their not in my life. I still keep pictures on the wall and old toys. I have life insurance policies with them as beneficiaries a home i own and they are named on everything as people who are allowed to know all my info. Medical and anything else that asks who i would like to know my info if they ask. The thought that someone would change their whole identity and make it harder for them to find me if thet choose to do so one day is unbearable. 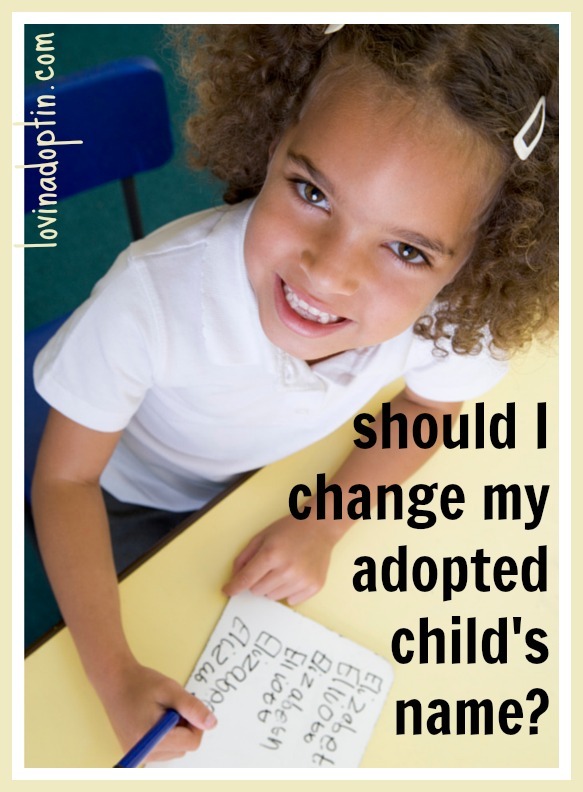 So please keep situations like mine in your mind before you consider changing your adoptive childs identity. Thank you for your input Stephanie. In the case if a child’s name being changed, I would hope the parents would allow them access to their birth name when it’s appropriate to do so. And remembered, it’s in very specific circumstances that I personally recommend changing a child’s name. Good to read this, my dilema is that my 7 year old wants to change his name because it is the same name as his birth father. He has been pushing for this for about a year now and has chosen the name he wants. He has been with us since he was 4 but was adopted 1year ago and it all began about then. My husband and I have done nothing to encourage this since we always thought this was something that should never be done but I’m finding it hard to ignore my son’s pleas and explanations for wanting to change it. It’s always my son who initiates the discussions about his name. He says that whenever people call him by his name it reminds him of his birth dad. I thought that in time his feelings on this would pass but they in fact seem to have got stronger. I can’t seem to find any information online on others who have experienced this but I imagine other families have been through this. I’d be interested to know your thought on this. You mention that you feel that names should only be changed when there are safety concerns, but I wonder about this situation. Thank you for your comment and for stopping by. I would definitely consider it in this situation, when the child has a negative association with their name and they are the one taking strides to get it changed. Personally, it would be something to consider. My now adult daughters were in kindergarten and second grade when placed with me for adoption . Their names were their identity . I changed the creative spellings to a standard one and gave them a new middle name . I used to say that I’d only change an older child’s name under certain circumstances: such as Waldo Eggbeet Jr. was abused by Waldo Eggbeet Sr. I would think the child might want to consider changing it. Even if the name was horrible , if that’s their name , I’d leave it alone. Twenty eight years ago , on my first job , I met a woman who was an adoptee and she told me , “I remember that my name used to be Nancy”. The look on her face spoke volumes and I remembered that when I began my adoption journey years later. Excellent input, thank you for sharing! Changing our daughter’s name is something I have questioned for a while without any good answers. This post is great and helped me to see some points of view I had not considered, such as the safety issue. Our little girl came to us when she was 2 and has a very different name from the rest of my children with a very difficult spelling. Since we will be the only family she ever remembers, I don’t want her to spend her life as the “obvious’ adopted child because of her name. But now at 3, she is pretty attached to her name and I’m not sure she would understand nor care for us calling her something different. Any suggestions? Is there a way to shorten her name, maybe give her a nickname that’s a derivative of hers with an easier spelling? I understand what is going on about changing the last name of child that had been adopted. I was a child that someone adopted me and they changed my last name. I didn’t like my adopted last name. So adoptive parents should reconsider changing the child(rens) last name. I would only agree if the child is older. Changing the last name is the joining of a new family, it is significant in my mind. This is the family who will raise this child and thus it seems appropriate the adopted child have their last name. Hello all !!! My husband and I are in the process of privately adopting with a close friend of ours . Unfortunately for her and her fiancé , cps has taken her away from them due to their living situation . Rather than handing the child over to cps for state adoption , they came to us because they knew that we have been wanting a child for a while now . They have stated that we would the best fit in raising their child rather than having a strange family that they don’t know raising the baby instead . My point being , the baby is female and 8 months old . The question came up to me and my husband from other family members asking if we wanted to change the name . We honestly didn’t know , we were mostly wanting to at least get the blessing of the bio parents to change her first and middle name. We discussed this with the parents , they understood where we were coming from in regards to the name change , but they insisted that we keep the first name because she is is 8 months old and already responds to that name . We kind of feel at a loss because we want to respect the wishes of the bio parents , but at the same time we feel that the new name would fit her personality more . Should we accept this And move on ? Are my husband and I being selfish ? Please help for any advice would be greatly appreciated . Hi, thanks for stopping by! Here are my thoughts, you will receive opinions from everyone on what you should or shouldn’t do with your kids, I say follow your heart. I would definitely consider that this child is aware of their name, and it’s familiar, however if it’s something you feel strongly about you should go with what you want. After all, she will have this name forever. When we first had to consider the name question, there we’re some legitimate safety questions in the mix. One of the options I broached with her was to still use her name at home, but her legal paper show a different name so she couldn’t be found easily. By the time we actually submitted finalization a year after the topic came up, the issue was gone & it was not a necessity any longer. But she had “played” with her new name for a year (whenever my daughters played role-olay games at home, my adopted daughter ALWAYS chose to use this name), so she decided it was what she wanted to do & was fully settled/committed to it. Partially because she hated her first name. It was the name for the horror/ghost character in one of the Japanese styled movies from the early 2000s character…where the ghost is white faced & bends oddly when they crawl. Buy also, when she was done choosing…. 3- and her new nickname was name found by my mom’s sister…just like Bio daughter’s nickname. So basically…she felt more “belonging” to us because of the connections & similarities, and was ready to make the change on her own terms. We were lucky in that everyone shifted with us mostly seamlessly. 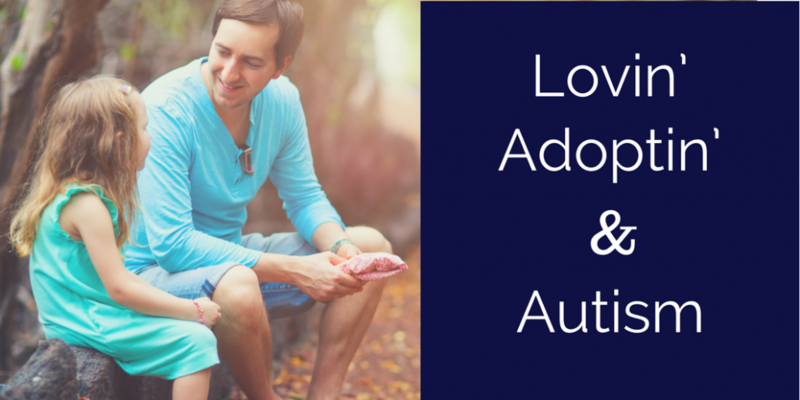 My husband and I adopted an almost 13-year-old boy through the child protective agency in our state. Prior to the finalization of the adoption, he started talking about changing his entire name. Since he was a junior to his biological father who had been so abusive to him and his siblings, we thought it was a good idea. Still, we didn’t push him. However, he was stressing himself out trying to make a final decision about what he wanted his name to be. We told him that it did not have to be done at the time of the adoption and could always be done later. On the day of the adoption, we simply added our last name, changing nothing else except dropping the Jr. After the adoption, he still said he wanted a name change but was not so stressed about it. We told him to take his time so that he was sure about it. After almost a year passed, he felt he had made a final decision. We still didn’t rush because we wanted him to be sure. After another month or two with no changes in what he said he wanted, we went through the process to have his name legally changed. It didn’t go well afterward. The innocent and immature responses of his cousin and brother made him second guess the decision he had made. They weren’t ugly about it – just curious and blunt. He would not tell anybody at school or church his new name. So now he has a legal name he never uses except for legal purposes – and that gets confusing. We plan to go through a legal name change again, but he still isn’t sure what he wants. His biological father is about to go to trial for the abuse he inflicted on the children. Who knows what he will want to do after that? It’s a crazy situation. His siblings won’t call him by his name because that’s what his birth father was called. However, they call him “Junior,” which I feel is just as bad since the nickname comes straight from the fact that he is named after his abusive birth father. Changing a child’s name can get really complicated. It is hard for everybody. If anyone on this site has any ideas you think might help us, I would love to hear them. I think it’s admirable that you’re listening to what your son wants as his name. I would suggest waiting until he makes a decision, I don’t think there’s a rush until he makes a firm decision on what he wants his forever name to be. Foster Children feel helpless and that they have ZERO input into their lives. Giving them an opportunity to create an identity that they have a say is HUGH for them, it empowers them! As a foster mom, I have an interesting situation, where our foster son doesn’t want to use his name any more and wants to be called by a nickname he made up. For the moment, we’re going with it (using both real and newly minted nickname), but I feel rather odd about it. What do you think? I don’t think it’s a problem to change last names, middle names or dropping some names if they have several. I think going with what your foster son desires is just fine. Go with your heart though. As a Foster Mother of a sibling group of three we’ve approached the name changing very carefully. Several weeks after we had to explain to the children that reunification, one of the children asked to know more about adoption. We explained what it meant and explained it would mean that their last name would change in the process. They were devastated at the idea of losing their last name! It took several weeks before they brought up the topic again, one of our children asked, “If we are changing my last name can we change other parts of our name, because I really hate my middle name?” From there we explained to them that they could change any part of their name they wanted, but our one request is that they kept part of their name, either the first or middle name. 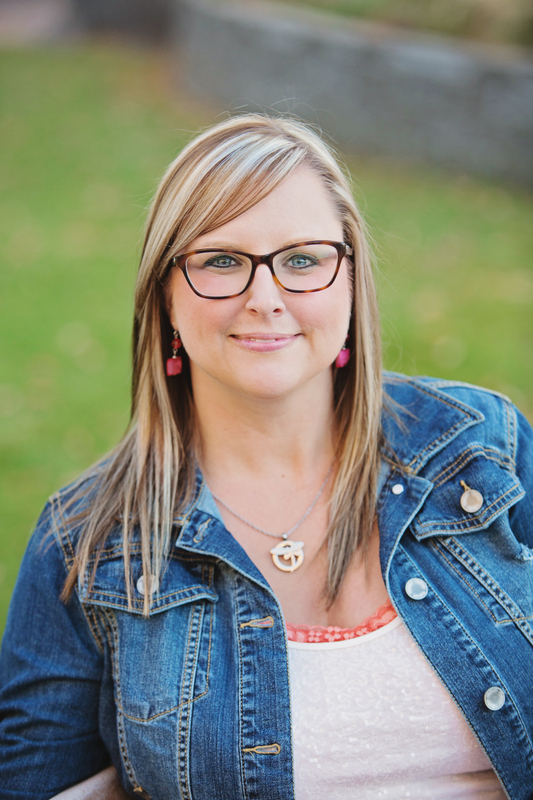 The question that melted my heart was when our youngest asked, “What would you have named me if I was born to you?” From there the door was wide open to discuss name changes, but at no time did we ever push it on them. We simply waited for them to process their new reality. Personally, I feel like encouraging them to keep part of their Birth Name gave them the opportunity to embrace the passed and their new future. Our daughter’s name was changed, but it was something she requested. We talked about how her last name was already changing, she didn’t need to change it all– but she didn’t like her old name and she already had a name picked out that she wanted. As time has gone by and she’s grown older, we’ve talked about it a lot. For her it really was leaving behind an old life and stepping into a new one. She went by her new name for about a year before we were able to finalize and we gave her up until the day-of to decide what name she really wanted. She picked her new name. I do think your points are absolutely valid though. We’re looking at adopting another older child soon and one of the first things we had to think through was his name, as it’s not a preference of either my husband nor I. We felt we had to get that settled before we went any further, because of these very reasons. If he doesn’t desire a name change, he certainly won’t have one. Thank you for responding! I think it’s absolutely fine to change their name when it’s something they want to do, and that she understood it coincided with a new start is wonderful.